If you’re looking for fast speeds and unlimited plan prices with no gotchas, T-Mobile is a clear winner. But its spotty coverage in rural areas keeps it from a full 5 stars. If you’re looking for fast speeds and unlimited plan prices T-Mobile is a clear winner. Find out how we rated it for speed, coverage, and performance. Not to be outdone by every other cell phone carrier that’s introduced a new plan, T-Mobile introduced the Essentials plan in early August 2018. We’ve updated this review to include pricing and features info on the T-Mobile Essentials plan. Enjoy! All the catchy commercials aside, why should you choose T-Mobile? The answer is simple: if you can’t stand phone plans covered in gotchas and fine print, the T-Mobile’s unlimited plans offers refreshingly up-front pricing. Those prices include taxes and fees and are still cheaper than three out of the top four cellphone providers. And though its coverage doesn’t match up to Verizon in rural areas, we think transparent pricing and high ratings for 4G speed make T-Mobile a great choice for city dwellers. * Prices include auto-pay and multi-line discounts where applicable. Taxes and fees not included unless otherwise noted. ** T-Mobile prices include taxes and fees except for the Essentials plan. How much is T-Mobile? Depends on the plan. T-Mobile plans come with no frills and advertised prices that include taxes and fees. It’s hard to find a straightforward cell phone plan out there, but we think T-Mobile plans comes the closest. It’s not every day you find a company that advertises its prices with taxes and fees included, but T-Mobile does. For the most part (the Essentials plan is excluded). While T-Mobile also offers prepaid plans and plans with no credit checks, the ONE unlimited data plan is its bread and butter, and its ONE Plus upgrade adds additional perks. Here’s a quick glance at how much T-Mobile ONE and ONE Plus cost. How much does the T-Mobile unlimited data plan cost? ** Prices include taxes and fees plus autopay, paperless billing, and multi-line discounts where applicable. Compare that to, say, Verizon, which offers up three different tiers of unlimited plans. You’ll have to read closely to find out what you get with each Verizon unlimited plan, but the T-Mobile ONE plan standardizes all those essential features—like 50 GB of unthrottled data each month, a 3G mobile hotspot, and streaming at 480p. If you’re a frequent flyer, you may just fall in love with perks of the T-Mobile ONE Plus International plan. Find out whether this is the best plan for your adventures abroad in our Best of International Plans review. Compared to other top four wireless providers, T-Mobile isn’t afraid to sweeten the deal with the ONE plan. While video streaming comes in at a baseline of 480p like its competitors, T-Mobile edges into the lead with perks like no speed throttling until you’ve used 50 GB of data in a billing cycle. Yes, you heard us right: 50 gigs. And AT&T, Sprint, and Verizon don’t even come close—they’ll slow you down at 22 or 23 GB. But T-Mobile also tacks on 3G mobile hotspot data, while AT&T doesn’t even offer a mobile hotspot unless you upgrade to its pricier Unlimited &More℠ Premium plan. T-Mobile offers those too. See how T-Mobile stacks up in our Best of Prepaid Plans review. T-Mobile recently introduced the Essentials plan, but sadly, its tradition of including taxes and fees in the advertised price doesn’t extend to this newcomer. That’s right, prices for the Essentials plan don’t include taxes and fees. We’re just as miffed as you are. But that price is still low—lower than even Sprint’s Unlimited Basic plan. How much does T-Mobile Essentials cost? * Price includes autopay and multi-line discounts. Taxes and fees not included. Turns out, you trade some features for that rock-bottom price. Here’s how the Essentials plan compares to T-Mobile ONE. Remember: Essentials customers get slowed first. It’s bad news for Essentials customers: they’ll be the first to have their data speeds slowed during times of high traffic. Pick a phone, any phone, including iPhones and Samsungs. But no Google phones. Womp womp. T-Mobile has a pretty big lineup of both iPhones and Samsungs—including older models if the price of a just-released phone makes you queasy. But if you’re a Google fan, you may want to look into bringing your own phone. Which top phones does T-Mobile have? Be ready to share your credit score—even average credit means you’ll most likely need to fork over a down payment on your phone along with monthly payments. This seems fairly common with other top four cellphone service providers, although we didn’t get asked about our credit when we signed up for Verizon. If you prefer to skip the credit check, you can—just be aware you’ll need to pay the full retail price of your new phone right then and there. How good is T-Mobile performance? T-Mobile doesn’t lead the pack for coverage in rural areas, but overall it gets good ratings in coverage reviews. And it’s pretty much neck and neck with Verizon for 4G speed. 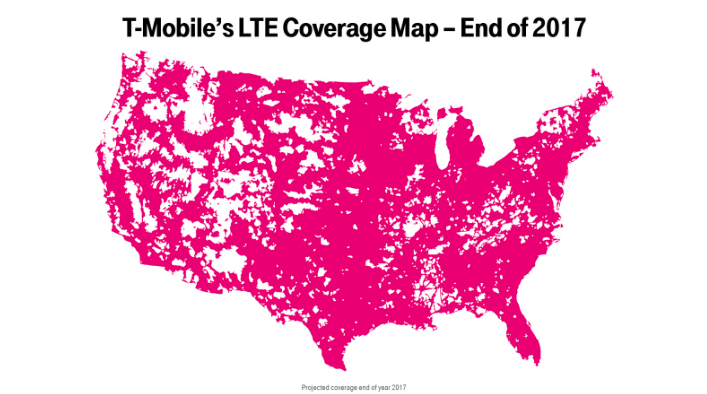 Turns out, T-Mobile has some pretty great rankings for coverage—we’d say it comes third, just behind AT&T.1, 2 If you want to be sure your area is covered, check out T-Mobile’s interactive coverage map. T-Mobile customer service—what’s the deal? The wireless industry as a whole has issues with customer service, but T-Mobile is trying to change that. Talk to a T-Mobile customer, and you’ll probably hear a mix of stories about customer service, both good and bad. We’ve had great experiences with in-store customer service in the past. Long story short, we ordered a phone from the T-Mobile site and it was stolen before it even arrived on our doorstep. Thankfully, the in-store representative walked us through what to do and how to get a replacement phone, and they remained understanding and helpful even though we showed up right at closing time. Visit your local T-Mobile store for a better experience. However, when we later noticed the stolen phone was activated and we started receiving a bill for it, we had to contact the call center several times to cancel the service and zero out the bill. Moral of the story? Visit your local T-Mobile store for a better experience. If you prefer to avoid phone calls and trips to the store, we feel you. You can make contact with T-Mobile and ask questions on social media. Prepare the hashtags. We hope T-Mobile will continue to improve on its customer service and keep pushing out transparent, easily understandable pricing plans. Because being able to understand what you’ll owe each month is important. Here’s the TL;DR for how T-Mobile ranks. Plans: T-Mobile offers a basic plan, Essentials, and a mid-tier plan, called ONE. And you can add on features for $10 more per month with ONE Plus.Overall, we’re pleased that T-Mobile plans are easy to understand—and that most of its advertised prices include taxes and fees. Oh, and there’s no activation fee. Performance: If you live in a city, you’ll probably have no problems with coverage, but if you live in a rural or suburban area, it might be hit or miss. And we think T-Mobile deserves a silver medal for speed. Customer service: Odds are, you’ll be well taken care of by T-Mobile’s customer service team. We personally found in-person interactions to be really helpful—the call center, not so much. Overall: If you want to balance price with features, we think T-Mobile is a great pick. It won’t cost you as much as Verizon, although you might run into coverage issues depending on where you live. Q: Does T-Mobile have overage charges? Can we just say that T-Mobile’s soft data cap of 50 GB each month feels oh-so generous? This means you won’t pay overage charges or get your data speed throttled until you’ve used up more than 50 GB of data in a billing cycle. Q: Does T-Mobile have an activation fee? No activation fees here, unless you activate a classic plan or a line in Puerto Rico. This means you save $30 or $45 compared to Verizon’s, Sprint’s, or AT&T’s one-time activation fee. That’s money you now get to spend on pizza. Or doughnuts. Q: Should I get the T-Mobile protection plan? First off, we recommend grabbing a case and screen protection on Amazon. But if you’re still concerned about damage to your phone, one of T-Mobile’s protection plans should do the trick. T-Mobile’s protection plans aren’t as easy to understand as, say, Verizon’s, so we recommend checking out its site for a full comparison. Q: Does T-Mobile let you bring your own phone? You bet. In fact, if you’re switching to T-Mobile from another carrier, you can bring your phone with you. T-Mobile will even sweeten the deal by paying off up to $650 of the remaining balance if you’re currently on a device payment plan that’s been in good standing for at least 90 days. To find out if you’re eligible for this deal, we recommend checking out T-Mobile’s FAQs. All T-Mobile asks is that your phone is unlocked and you grab a T-Mobile SIM card. Easy peasy. Check out its bring your own device program to get the full details. Don’t worry—your mom doesn’t need to memorize your new phone number if she wants to call and chat. Chances are more than good you can transfer your old phone number to T-Mobile. If you want to be doubly sure, you can even check if your number can be transferred online. Don’t cancel your account or toss your old phone before you transfer your number to T-Mobile. While you may be ready to cut ties, keeping your service until the transfer is complete helps make your transition smoother. Q: What are T-Mobile’s return policy and cancellation fee? The sooner you decide you want to return your phone to T-Mobile, the better. Depending on where you bought your device (in a store, over the phone, or online), you’ve got a different set of rules to work with. We recommend taking a look at the T-Mobile return policy to make sure you don’t run into issues. The same goes for T-Mobile’s early termination fee—there’s a lot of lingo in there that can make it difficult to understand. You can read up on it in the early termination fee guide. Q: Does T-Mobile give discounts? Yeah-huh. T-Mobile has discounts for active duty military, veterans, and their families, as well as discounts for anyone aged 55 and older. Get 50% off lines 2–6 on the T-Mobile ONE plan (with autopay). Available to active duty, veterans, National Guard, Reserve, and Gold Star family members. You’ll need to verify your military status within 45 days to stay eligible for the military discount. Get two lines for $75 per month (or $55 per month for one line)—this includes unlimited talk, text, and LTE data. Available to anyone age 55 and older. Only the primary account holder needs to be 55 or older—your account buddy can be younger. You’ll need to send T-Mobile proof of your age too.